Costa Rica was discovered by Christopher Columbus in 1502; it became politically independent in 1821, and started its life as a republic in 1825. The first heads of government were school teachers. 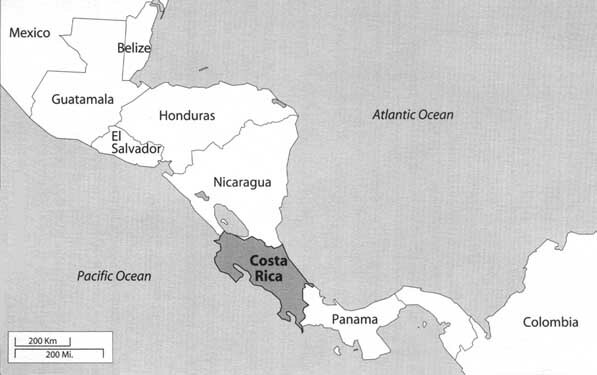 The Costa Rican territory has an area of 51,100 km� and is located on the isthmus of Central America (Figure 1). In 1992, it had approximately 3 million inhabitants, mostly whites and mestizos; other races represent less than 5% of the population and show a strong trend towards integrating with the rest. Around 10% of the total population consists of immigrants and Central and South American refugees. The Costa Rican economy is based on agricultural products, such as coffee, bananas, sugar, and meat. A light industry has emerged in the past 20 years, and tourism has been developing recently. The country is known for having a well-established Western democratic political system, which has been interrupted only twice in the last 100 years. All governments have stressed education and health, which has resulted in a literacy rate of less than 10% and one of the lowest overall mortality rates in the world. Thanks to the convergence of these factors and the historical evolution of the country, Costa Ricans share a strong spirit of solidarity and a deep respect for law, social justice, and freedom. The constitutional abolishment of the army in 1949 made possible a further increase in social sector investment. Law enforcement and security were turned over to a civilian police force, which comes under the Supreme Electoral Tribunal during election periods and changes every four years with the government. In the 1970s, there was a sharp increase in the country's commitment to making health services available to everyone. This emphasis on investment in health is another feature that distinguishes Costa Rica. Table 1 presents some milestones of Costa Rican history.  First phase (1850-1900): characterized by isolated efforts to provide basic health care, especially to needy groups.  Second phase (1900-1940): characterized by the introduction of health programs and the expansion of a welfare concept to assist poor groups; creation of the Ministry of Public Health.  Third phase (1940-1970): appearance of a pronounced interest in preventive medicine; attempts to establish a National Hospital System; creation of the Costa Rican Social Security Institute (CCSS).  Fourth phase (1970- ): a National Health Plan was drafted and implemented in the 1970s to provide health care to the whole population and to control or eradicate malnutrition and common infections. The National Health System was consolidated in the 1980s. In the same decade, new health care models were initiated and the integration of the Ministry of Health and the CCSS progressed; new programs for the prevention of chronic diseases were started. From pre-Columbian times up to the seventeenth century, the practice of medicine was in the hands of native healers. When the Spaniards arrived in the Americas, however, these practices were combated and the so-called witch doctors were persecuted. In 1790, Esteban Corti, who graduated in Europe, became the first physician to come to Costa Rica. He was soon accused of practicing witchcraft and sent to Guatemala, where he was judged by the Inquisition. Some of the oldest pieces of health legislation in the country are the Decrees dated duly 3 and September 29, 1845, which established the San Juan de Dios Hospital and the First Charity Board, respectively. During the first decades of this century, several laws, regulations, executive decrees, and general resolutions were adopted on issues related to public health. In the beginning, they were isolated efforts without appropriate coordination. As time went by, an organic infrastructure independent management were achieved that responded to the ideals of improving the health situation. As can be seen in the following public health legislation, avant-garde health criteria inspired the political decisions at the time. The Decree dated September 1, 1914, created the Public School Hygiene Department to protect the health of children between 7 and 14 years of age. The Department hired the first school hygiene assistants trained in the country. It was in charge of medical, dental, and ophthalmological school clinics. It also took care of hygiene in schools and summer school camps, the latter created in 1920 to shelter temporarily abandoned children or orphans. Subsequently, legislation for the prevention and treatment of public health problems was enacted and gradually expanded. It approached problems as varied as tuberculosis, malaria, venereal diseases, smallpox, leprosy, yellow fever, typhoid, and narcotics abuse. The first steps toward setting up a vital statistics system were also taken. The first prenatal and child medical clinics, considered the foundation of public health because of the protection they provide to human beings from conception onwards, were established in 1920. Law No. 52 on Public Health Protection, enacted on March 12, 1923, was an important complement to this organic restructuring. It recognized national health as a government obligation and local health as a municipal responsibility. To comply with all the provisions of this law, it was essential to have trained staff, and therefore efforts were concentrated on this goal. In 1924 the School for Health Inspectors was created, and in 1926 the role of the school assistant for health was redefined. In 1927 the lack of school assistants for health resulted in the school assignment of nurses graduating from the Faculty of Medicine and the Max Peralta Hospital of Cartago, that offered a three-month practical apprenticeship in the School and Children's Clinic of San José. At the same time, these training institutions incorporated courses on puericulture and school hygiene into the nurses' study plan. The same 1927 law created the category Social Worker to Combat Tuberculosis, and in 1928 another law created the first employment for obstetric nurses to compensate for the lack of physicians in villages. All tasks previously assigned to the Welfare Secretariat under the Office of Foreign Affairs were transferred to the Office of the Undersecretary for Hygiene and Public Health. These tasks were related to hospitals, lazarettos, shelters, maternity homes, and child protection institutions. Strengthened in this manner, the Office of the Undersecretary became the Secretariat for Public Health and Social Protection through Law No. 24, dated June 4, 1927. This gave the new Secretariat the political authority and consequently, the support necessary for the projects submitted to the Congress of the Republic. The profession of Official Physician was created in 1931, replacing the profession of Village Physician. Official Physicians had broader functions based on work criteria of social protection and well-being of the community and not just treatment and charity. The position of Director of Health Units was created in 1936 with qualifications similar to those of Official Physicians: health directors, coroners, school physicians, and those responsible for assisting the needy and taking care of work accidents. Another significant law was Executive Decree No. 5 dated October 8, 1935, which repealed the Decree creating the Charity Brotherhood for the Limón Hospital and replaced the Charity Board with the Board for Social Assistance. The Decree shows how the "charity" concept which had prevailed for such a long time began to change into social protection with the participation of the government. Originally, this autonomous government institution, created by Law No. 12 dated October 30, 1924, was called the National Insurance Bank. It represents the culmination of an interesting chapter of our history, which goes back to the nineteenth century. Before 1924, all insurance was in the hands of foreign companies. At the beginning of this century, insurance was necessary because of the industrial and commercial boom; businessmen, for example, were investing tremendously in imported goods and had to protect them. This gave rise to a plague of arson as some businessmen set their businesses on fire to collect the insurance, endangering property and life. It became necessary to regulate the relationships between the insurance companies and the insured and to stop the flight of foreign exchange. It should be noted that the creation of the National Insurance Bank was closely linked to the attempt to legislate on the responsibility of employers for work accidents. Even though the law proposing disability protection and workmen's compensation as responsibilities of the employer was drafted in 1907, it took years to finalize and was finally enacted in 1925. The year following its establishment, the National Insurance Bank assumed the whole responsibility for the fire fighters. Only in this manner could a certain level of security for citizens be guaranteed and bank losses minimized. The National Insurance Bank started offering life insurance in 1925. In 1926 it monopolized fire and work accident insurance. Progressively, the Bank took over other insurance, such as fidelity bonds to cover the risk of losing money and other securities, motor vehicle insurance in 1943, and crop insurance in 1969. In 1940 it was authorized to grant construction loans accepting life insurance policies as security. As of 1948, the National Insurance Bank became known as the National Insurance Institute. At present it is governed by a Board of Directors and an Executive President appointed by the Government Council. This period includes the creation of the National Hospital System and the Costa Rican Social Security Institute. The implementation of preventive medicine requires a solid health organization, as well as excellent intra- and interinstitutional coordination. The final consequence of several measures taken in these decades was the progressive strengthening of the Health Secretariat: different departments or divisions were created or reorganized, international cooperation was channeled, structural changes were made, and better financing was arranged. Some of these measures, as discussed below, were important for many health achievements of the country. The first General Regulations on Foundations and Boards for Social Protection were promulgated May 20, 1941, giving these social entities public status. At the same time, it entrusted them with the administration of hospitals, homes, cemeteries, and other centers, the technical direction and economic supervision coming under the Directorate General of Medical and Social Assistance. Health centers, also operating under the administration of these Boards, were supported to a large extent by governmental subsidies, the Charity Tax, and the National Lottery. The first Health Code was published December 18, 1943, according to Law No. 33, which repealed Law No. 52 on Public Health Protection of 1923. The 1943 Health Code summarized the abundant legislation passed throughout the years and the ample experience on health aspects. The Code also made reference to the organic structuring of the Health Secretariat, and to local and international health standards and controls.  Coordination of all medical assistance and social protection institutions.  Provision of technical and financial management and of the above public centers.  Technical supervision of privately owned analogous institutions. The General Medical-Social Assistance law called for a modification of the distribution of funds from the National Lottery and, years later, the General Regulations for National Hospitals were promulgated. At the end of the 1940s, the Health Secretariat changed its name to the Ministry of Health with three directorates: the Health Directorate, in charge of all tasks related to public health; the General Directorate of Medical-Social Assistance, responsible for all medical assistance institutions; and the Administrative Directorate. Law No. 13 of 1926 classified snakebites as an occupational disease of farm workers and could thus be considered the first harbinger of today's Costa Rican Social Security Institute. In this sense, other laws that also heralded Social Security were Executive Decrees No. 2, dated July and November 8, 1935, which regulated Law No. 30 of December 1934 on hospital admissions of banana industry workers and the utilization of the 1% withholding on banana sales specified by the law. ... the establishment of social insurance, regulated by the compulsory contribution system by the government, employers and employees, for the benefit of laborers and intellectual workers, to protect these against the risks of disease, maternity, disability, old age, and death, and other contingencies determined by the Law. The administration of the insurance would be entrusted to an autonomous institution called Costa Rican Social Security Institute. The Constitutive Law of the Costa Rican Social Security Institute was issued on October 22, 1943. As of September 1, 1942, the Illness and Maternity Program was gradually implemented. Initially, it was limited to the economically active group of the metropolitan urban area and provincial capitals with higher population density. It was quoted on the basis of 400.00 colones per month and it covered only directly insured persons. From 1944 to 1947, when the rural population was included and family insurance was established, its coverage was expanded to the Central Valley. The Disabled, Elderly, and Death initiative came into effect on January 1, 1947, to give compulsory protection to wage earners. At the end of the 1950s, the Illness and Maternity Program covered 27% of the economically active population and 18% of the total population of the country, while the Disabled, Elderly, and Death initiative covered 8% of the economically active population and 7% of the total population. Through Law No. 2738, the obligation of universalizing all insurance under its responsibility, including family protection in the Illness and Maternity Program, within a time frame not to exceed 10 years, was imposed on the Costa Rican Social Security Institute by the Legislative Assembly. This goal, however, was not achieved. At the end of the 1960s, only 38% of the economically active population, 45% of the total population of the country, and 60% of wage earners were protected by the Illness and Maternity Program, while only 24% of the economically active population and 28% of the total population were covered by the Disabled, Elderly, and Death initiative. Family protection in the metropolitan area only materialized in 1965. Law No. 4750 reformed Article No. 3 of the Social Security Constitutive Law, thus eliminating contribution ceilings for the Illness and Maternity Program. This measure was the manifestation of the political decision to expedite the insurance universalization process. At the end of the 1970s, the Illness and Maternity Program already covered 84.3% of the total population (2,162,080 inhabitants), and the Disabled, Elderly, and Death initiative covered 17.6%. During the first part of the colonial period, the city of San José was a small and very poor town with a serious water supply problem. The water problems were the result of remote water sources, topographic conditions, dense forests nearby, and the poverty of San José's inhabitants. Wells were initially dug. Subsequently, an 8-km ditch was dug, which ran along First Avenue and, once it reached the corner of the present National Bank, turned to the north to flow into the Torres River. The land for the Aranjuez water tanks was bought in 1866. It was not until 1968 that the water pipeline was inaugurated and its management turned over to the Municipality. As time went by, other aqueducts were built in the urban areas. They were not, however, a response to established national priorities but were the result of municipal initiatives with municipal funds and, in only a few instances, by the Ministry of Health. The first steps to control water quality in Costa Rica were taken in the 1940s, in a small laboratory installed for the Tres Rios Water Treatment Plant, administered by the Municipality of San José. The water laboratory of the Ministry of Public Health (its name at that time) started doing bacteriological and physical-chemical water analyses in 1951. Water chlorination started in 1952 at the Tres Rios Water Treatment Plant; the process was a failure, because the necessary technical and economic resources were lacking. The fact that financial and technical resources were scarce and that the water service was scattered made it impossible to coordinate the use of hydrographic sources on more rational terms and to standardize the water treatment and quality control to guarantee water potability. As a result of this situation, the National Service of Aqueducts and Sewerage was created on April 14, 1961, by Law No. 2726. In 1976, its name was changed to the Costa Rican Institute of Aqueducts and Sewerage by Law No. 5915. It is a public and autonomous entity in charge of solving all problems related to the drinking water supply and to the collection and assessment of sewage and liquid industrial wastes. It is also in charge of standardizing storm water sewers in urban areas.